Terre Haute Towing Service is the leading tow truck service in the Terre Haute area. 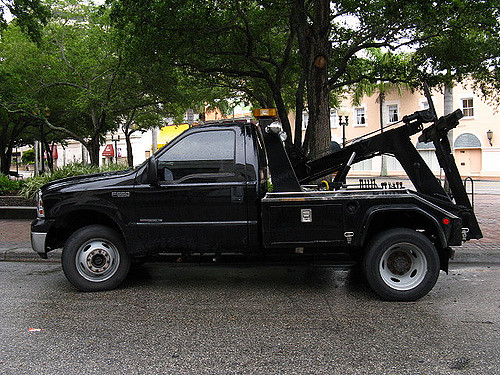 We have worked very hard for a very long time to create a different image for ourselves than that of most towing services. When most people think of a wrecker service company, they think of rough-hewn, hard-edged individuals without much courtesy or consideration for customers. So they are rather surprised when they see how polite and professional all our employees are. We give all our employees thorough training on how to treat customers right. Before we let them get into the cab of one of our trucks, we make sure that they will represent us right to the world. We make sure that they learn very quickly that we have no toleration for any kind of rudeness or discourtesy, and no toleration for things like drugs either. We pride ourselves on the training we give to all our employees, and that is one of the biggest reasons why customers who do business with us are so surprised. But training isn’t the only reason for our reputation for sterling customer service. We also go the extra mile to qualify our employees before we hire them. We are not one of those companies that will employ someone just because they have the proper license. We go into the background of all those who come to us, and we have long talks with them too, to make sure that they are the kind of people that will make us proud. In addition to the best employees, Terre Haute Towing Service can offer you the best equipment too. We have the very latest towing equipment available, and we keep it well-maintained and as clean as it can possibly be. It is important to have the right tools and to respect those tools, because the job you do is only, in the end, as the tools you use. We pride ourselves on always keeping up with all of the latest developments in technology in the towing field, and by consequence of that we can usually work faster, safer, and more efficiently than other towing companies do. As a result of this we can often make big savings in towing operations, and we are able to pass such savings on to our customers. ​The vast majority of our services are focused in the area of towing, but we also offer many services in the area of roadside assistance. Our trucks are radio-dispatched, and so we can get them to anyone stranded out of the highway with great rapidity. And when our driver reaches you, wherever you may be, he will have some very kind and helpful words for you; as we said before, most people are surprised by the thoughtfulness and courtesy, as well as the professional competence of our drivers. That’s because our drivers have been so thoroughly trained to understand that their job is much more than just doing things like delivering cans of gas and changing flat tires. They realize that someone whose car has broken down out on the highway, or maybe who has even been involved in an accident—is probably going to be extremely stressed and perhaps even in a kind of panicky state. And so they know that a very significant part of the service they render will be in helping such people to handle their stress. If you have any kinds of questions about the services we offer, or if you require more information of any kind, please just fill out the form on this page. And we will get back to you just as fast as we can. our towing services is second to none.